Agreement where an artist appoints a producer to produce a recording or a number of recordings for the record label that the artist is signed to. 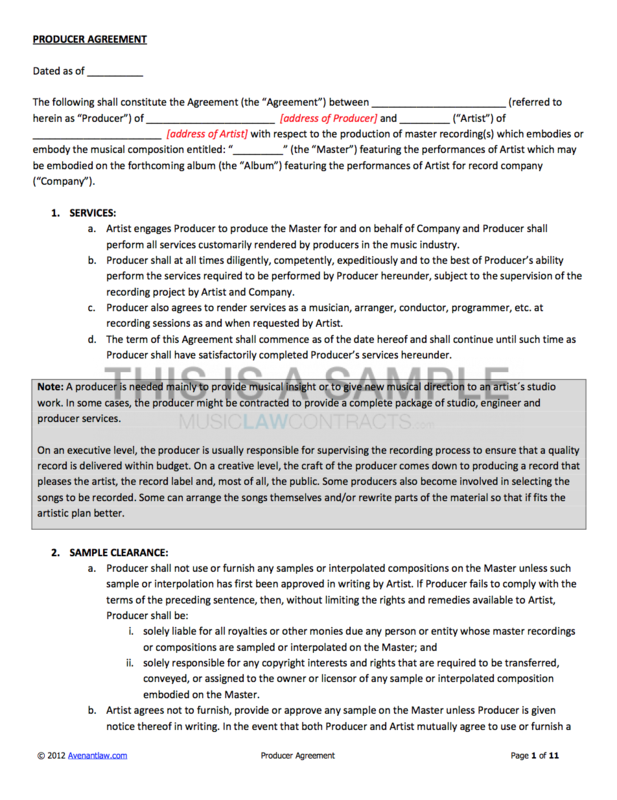 Agreement where an artist appoints a producer to produce a recording or a number of recordings for the record label that the artist is signed to. The label makes available a budget for the producer which is inclusive of a recording budget (money used to pay for studio and general expenses incurred in the making of the records) and an advance. Said advance, although non-returnable, is fully recoupable from the share of royalties the producer will get once the recordings are commercialised. This agreement is made between a producer and an artist who is already signed. Masters produced by the producer will become part of the artist repertoire that is assigned to the record label under a Recording Agreement. The template also contains letters of direction (1) to label in respect to payment of budgets and royalties to producer and (2 – US version only) to SoundExchange for the collection of statutory performance royalties deriving from usage in radio, streaming services and TV music channels.